I tell you all over and over that we have the best customers...because we do! Well, we also have the best blog readers. Seriously, you guys are really great. I get so many kind emails & comments every single day. My very favorite part of running this blog though, is seeing your finished projects! To see your finished kitchens & baths and know that we've helped, even in a small way, by providing you information and inspiring photos, makes all the time and effort that this blog requires totally worth it! A few months ago a comment on one of my posts by Janet from The Army Mom blog caught my eye. I headed over to her blog and fell in love with her fun personality and writing style. I was also really impressed with her kitchen transformation. I emailed Janet and asked her if she'd mind doing a little interview about her kitchen that we could feature here on our blog and I got THE BEST EMAIL I HAVE EVER RECEIVED back from her. Here's a paragraph from her email to give you an idea of why it made my week..."I must tell you that I spent A LOT of time at your blog during my research - In fact, I called my husband over to show him photos and to have him read snippets of your posts so often, he began to refer to your blog my boyfriend! As you already know, I l-o-v-e Carrara marble so I couldn't get enough of the photos and mentions of it on your blog"
We all cracked up about our blog being her "boyfriend"! So, to make a long story longer, Janet agreed to answer my questions about her kitchen and let me post the Before & After pics. Janet's kitchen 'After'. Photo: The Army Mom. Steph: You turned a dark and dated kitchen into a fabulous bright and beautiful kitchen. What is your favorite part of your white kitchen? Janet: Honestly, the island is my favorite part of my white kitchen. 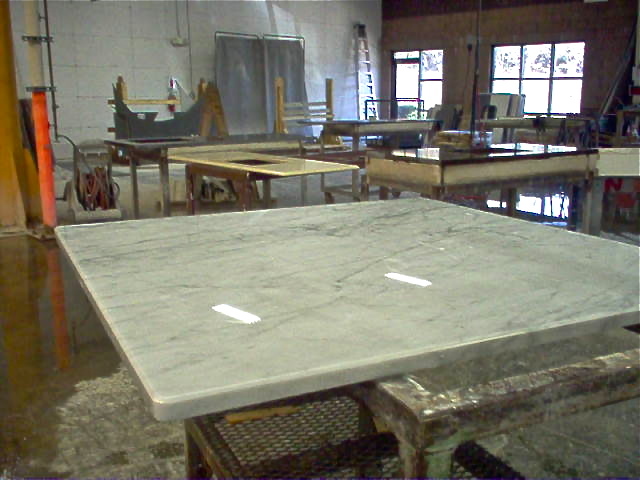 Primarily because we nearly tripled the work surface and of course, because my Carrara marble wishes FINALLY came true! While the existing island was too terribly small to be functional, replacing it with a larger one wasn't feasible, due to the space constraints of our kitchen/the (narrow) room. Of course, I would have loved to gut the kitchen and start over; however, since the entire house needed remodeling and, this California transplant couldn't imagine living in the South (humidity) without sinking a pool in the yard, we had to consider our budget. Nevertheless, had I been able to gut the kitchen down to wall studs, it would certainly look very different than it does today - It would still be all-white and I would still use Carrara marble... Only more of it! By expanding the work surface of our existing island, I got just what I was after, which was more work surface. By adding Carrara, I got my Dream island! Photo: The Army Mom. To see more Before pics go here. Steph: Why did you use Corian on your perimeter countertops and Carrara marble on the island? Janet: Frankly, because I listened to, "the experts" and did not follow my heart. I listened to those who told me first that using Carrara would absolutely obliterate our budget, (NOT true) and secondly, that natural Carrara is reserved for homeowners that want their kitchens to look pretty... Not for avid hobby chefs and bakers that intend to actually USE their kitchen. Also, NOT true! Additionally, my husband, a warranty manager for a national home builders at the time, believed natural stone was too cold, on top of being high maintenance. Again, while one could certainly argue that Corian is warmer than natural marble, and Corian's done a nice job of mimicking the look of carrara with their "Rain Cloud" style selection, the fact of the matter is that nothing is more beautiful or worthy of the investment you'll make in your home than natural stone and/or marble. Knowing what I know today: That high-quality natural stone and marble does NOT always cost more than their synthetic cousins, (hello, Surface Products of Charlotte, NC!) and that care and maintenance does not need to consume you, I would have remained true to what I really wanted for my kitchen and not even considered Corian! This is Janet's perimeter countertop that is Rain Cloud Corian. The sample sitting on it is real Carrara marble. Pretty close in color right? Photo: The Army Mom. Steph: Of the two surfaces (Carrara marble & Corian), which do you feel is holding up better? Janet: In terms of asthetic appeal, I must say that hand's down, my marble is holding up better than my Corian! While Corian is nearly indestructible, after all, it can be filled and sanded down to remove blemishes, pits, chips, knife marks, etc., there's no denying that it is dull and looks very flat. Perhaps the dull finish is simply a characteristic of the style we chose, (Rain Cloud) which is meant to resemble Carrara; however, almost immediately, the Corian lost its shine/sparkle and over time, with even VERY careful use, it revealed itself to be what it is... a lifeless impostor to natural marble. As an aside, I want to mention that I also regret choosing the integrated sink option with the Corian. It is not usually mentioned, but the fact is, Corian will develop spider-vein like cracks in the corner and around the drains if it comes into contact with very hot water... Which is a problem when you need to drain pasta! Now, my Carrara on the other hand is holding up beautifully! Unlike Corian, it immediately stands out as the star of my kitchen. When visitors enter my kitchen they IMMEDIATELY comment on the Carrara. I hear lots of, "Wow's" and my favorite is still, "oh!... You have marble in the kitchen" a comment that is often accompanied by a tone that conveys a slight hint of envy. And why not? There's a depth and a movement to Carrara that draws you in and makes you want to love it. I find it's very much like an ocean view, it changes with the light and calms, no matter what your mood... It's true what they say, Carrara is viewed by many as a status symbol and even a little goes a long, long way! 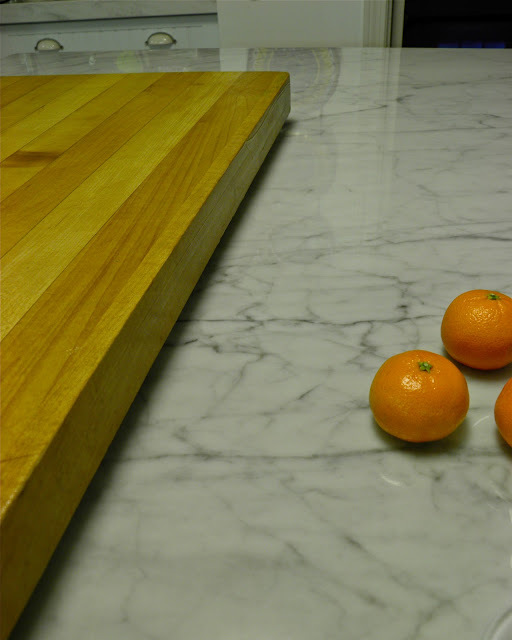 Steph: Have you had any problems with etching or staining on your Carrara marble? Janet: Actually, yes! My Carrara has etched... Of course, I didn't do it because I know better. And, in his defense, my husband knew better too. But that didn't stop him from squeezing lemon all over his salmon - on a plate that just happened to be sitting on my new cararra island. Fortunately, there are only three tiny, tiny etched spots and if I didn't point them out to you, you'd never, ever be able to pick them out. And, even after sitting on the marble for hours, the etching is so slight, you can barely feel it. Most marble fabricators, (and especially Corian salesmen!) will point out that etching can occur, but they usually demonstrate it by leaving a cut lemon half on a sample piece of Carrara, which after a few days reveals etching that cannot be repaired. However, I find that if wiped up immediately or at least the same day, tomato, lemon, orange and other acidic juices won't etch my carrara marble. Now, in terms of staining, no problems there! I've had frozen blueberries roll across the surface of my marble, but as long as I'm right behind them with a damp towel, there is no permanent staining. As picky as I can be, I can honestly say that I am NEVER fretting about my Carrara! Let me also say this... I decided when I installed the Carrara to let it live and to live with it. While I've certainly have my moments of wanting my home to look museum-perfect, I've relaxed more as I've gotten older and I realize today that there is a lot to be said for things that look their age, (including me!) While I'd prefer the $3,000.00 leather chair in our den was not discolored near the top of the back cushion, it makes me smile each time I remember how comfortable and content my husband always looks while his head rests in that spot while he's engrossed in a book he can't put down. Same goes for my Carrara marble. I know the memories to cherish in the years to come about how much I loved using my Carrara will far, far outweigh any of the momentary frustration I may experience after it suffers a stain here, or an etch there. If I leave my home and, my Carrara with it well worn, etched, pitted and stained, it will only mean that I lived my life there to the fullest. Steph: Do you regret using marble in your kitchen? Janet: Absolutely not! My only regret is that I didn't use it on all the counter tops in my kitchen. Had I known marble is often less expensive and not as difficult to maintain as the experts say, Corian would have never been an option. Steph: Any regrets on your kitchen remodel as a whole? Janet: No. I make it a rule to only learn from my mistakes and to never regret the decisions I make. With that said, do I wish money wasn't an object so that I could have blown out a wall and added the wall-ovens and sub-z I've always fantasized about having in my kitchen? Sure! 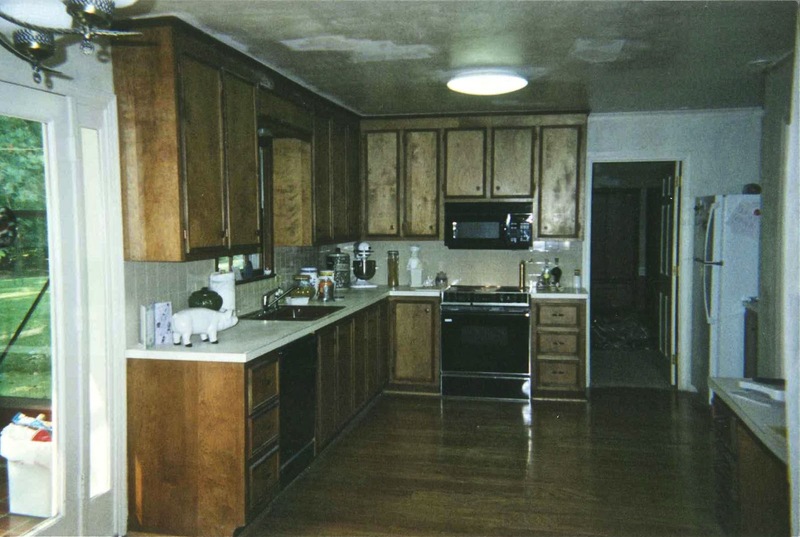 But all in all, for less $12,000.00, (less than $18k, including appliances) I believe we achieved everything necessary in our remodel to update our dark, 70's-era kitchen. As a former Realtor, (currently licensed/not active) I took my own advice and did not over-improve my home for our neighborhood. I spent according to our budget and to our home's character. I chose white because like Carrara, white goes with everything, is easily adapted to trends, and frankly, like the white sheets and towels I insist upon for use in my home, it simply makes me happy! Steph: What edge detail did you select for your Carrara? Steph: Tell me about your fabricator/installer. Janet: I wouldn't be nearly as happy as I am with my Carrara marble island were it not for the expert advice and, Best-in-Class customer service I received from Anne and her husband and staff at Surface Products in Charlotte, NC. They offer remnants and full slabs of the most beautiful marble and granite you'd ever hope to see and prices to fit every budget. The fact that they support our troops and donate their time and materials to build homes for our veterans is just another reason this Army Ranger Mom loves them! A photo of Janet's island being fabricated in Surface Products' shop. Photo: The Army Mom. Steph: Would you use marble in a future kitchen? Janet: Absolutely! Now that I know better, I will do better in the future. However, until the next opportunity for me to do so comes along, I want to do all I can to encourage others considering marble for their home to trust that it is the right choice! Even after second-guessing myself and choosing Corian for my kitchen counter tops, I never settled or stopped longing for Carrara. So I starting making it right by first adding a little slab to the step in my shower, (you can see it here) and then by adding it to the island in my kitchen. Today, if cost were not a concern, I would gladly, (and quickly!) replace the Corian in my kitchen with creamy, vibrant, white and alive Carrara! Thanks again Janet for taking the time to educate our readers about your experience with a marble kitchen! My favorite part of Janet's blog is that traffic to her blog helps increase ad revenue that is paid to her through a featured publisher agreement with BlogHer. All revenue generated by her blog is directly donated (100%!) to Wounded Warrior Project. Additionally, she takes no tax write offs for these donations, opting to donate what she would get back to Wounded Warrior Project. How amazing is that? Janet also wanted to let you know that if you participate in United Way Giving through your employer, Wounded Warrior Project is one of the charities you can designate to receive your donation too. Although, giving directly eliminates the administration fee United Way keeps. Nevertheless, she encourages everyone to learn more here. If you can please support this amazing charity by making a donation of your time and/or any amount of money they might be able to share by going to their website. You can read more about Janet and why she is so passionate about the Wounded Warrior Project on her blog. To see more pictures of her beautiful kitchen and to read more about her kitchen remodel be sure to visit her blog. I love this story! 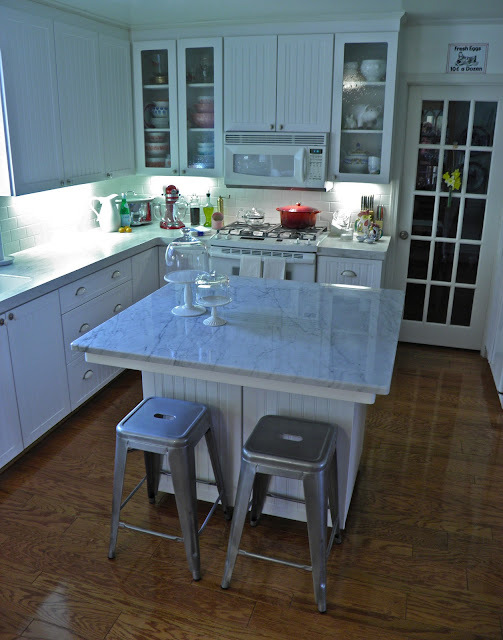 Love the white kitchen, and the beautiful carrara island counter top! Great article! I'm considering calcutta gold marble for my kitchen but I'm soooo worried about the etching. This made me feel better. I need to live and let live like Janet advised. I think that's the only attitude to have if you decide on marble for a kitchen. As one of Janet's blog followers I remember when she was going through the process of changing her island and all her research on it. I was sold on carrara by the time she installed it. The beauty of it is an added bonus to its function. Thanks for a great feature story of Janet and her kitchen with that wonderful carrara island top. I love Janet's blog and like you, truly enjoy her personality and writing style. She always has such beautiful photographs to accompany her charming posts. This was a wonderful interview to read and though I followed the island makeover on her site, it was a pleasure to read about her experiences with her carrara since having installed it. I think it is wonderful that Janet support the efforts of Wounded Warriors through her blog revenue. Speaks so well of the beautiful, caring woman that she is.